Suitable for various sample size: cylinders up to dia. 160x320mm, cubes up to 200 mm, prisms 40x40x160 mm etc. Aluminium and steel structure incorporating a high precision inductive transducer. Three units are generally recommended for axial deformation measurement. They can be easily applied to the specimen by a pair of elastic bands supplied as standard. It has to be connected to a suitable data logger or, directly to our Automatic control consoles Advantest, MCC or Automax Multitest which can provide cyclic loading and automatic determination of the Modulus of Elasticity. A data logger as, for example, our model 82-P9008, can be used with compression testers for axial deformation measurement when it's not mandatory to perform loading / unloading cycles, but only loading ramps. In this case, one of the channel of the data logger should be used for the load signal coming from an additional pressure transducer with 3 way connector fitted to the compression tester. Please get in touch with our technicians for complete information and service. 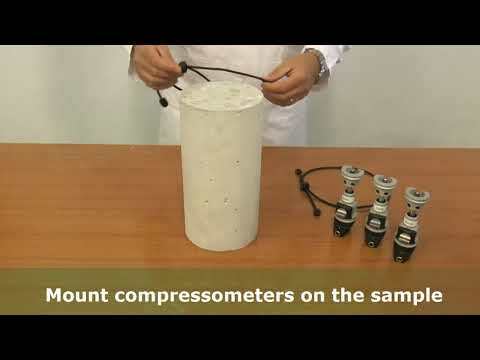 Electronic universal compressometer-extensometer for cylinders, prisms and cubes. Complete with distance piece for small specimens, template for gauge length and pair of elastic bands to hold the meter to the specimen.